The big 4-0 is looming. There are times when I wonder what I have achieved in these years past. If anything at all. Perhaps there is a need for a dramatic overhaul, maybe I need to rethink my strategy and play the game differently. And then I think of the things that have come to pass and realise that that is exactly how most 40 year olds have lived their lives. Bar a couple, maybe. What about you, my dear reader? Have you reached the dreaded milestone yet? Or are you still languishing in the long forgotten 20s? Or are you the one who has taken it all in their stride and marched along, living by the adage that life indeed does begin at 40? I have been pondering a lot about this phase in my life, and have come up with a little quiz to shed light on how you tackle 40. 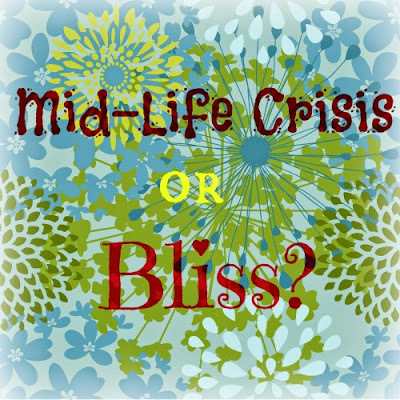 If you answer 'yes' to most of the questions, you, my friend, have circumvented the dreaded mid-life crisis and have achieved middle-age Nirvana instead. If the majority of your answers are 'no', it is time for a serious rethink. Good luck! See how you get on. Are you finally at peace with the way you look? This means no more frowning at the wobbly bits every time you stand inspection in front of a full-length mirror. You have never contemplated botox or plastic surgery, and are quite content with your advancing age. Are you still wearing your hair the same way you did yesterday? Or the year before? So you haven't resorted to any drastic measures to hold on to your fast disappearing youthful appearance. Like shaving off your thinning head of hair in the hope that it will all grow back shinier and fuller and thicker. Are you still driving the old family car you bought all those years ago? And you do not feel a compelling need to swap it for a swanky new set of wheels that costs more than your home. Likewise, are you still married, hopefully happily, to the 40+3 something you fell in love with all those years ago? And you do not feel a compelling need to swap it for something more pert. Have you resisted the impulsive urge for a wardrobe overhaul? Where you spend good money buying knee-high boots and a halter-neck you will never wear. Have you finally invested in that all-inclusive gym membership? There is only so far you can go with a middle-age spread and creaking bones. And everyone needs to up their cardio, no matter what their age. So there. Nothing to do with appearances. Have you bitten the bullet and got your eyes tested? And are now happy to flaunt your presbyopic reading glasses. You can squint at the computer screen only for so long. Are you still drinking caffeinated drinks? Maybe less than you used to, but not everything can be replaced by decaf and green. Are you happy to confess to your age? There are few willing to stand up in a room full of people and declare their true age. It takes courage that not many possess. Do you smile in your selfies? Not a self-conscious pout, I am talking about a nice toothy grin showcasing your not-so-pearly whites. There you have it. The mantra to beating the mid-life blues. It is all about acceptance. We are not talking frumpy and dowdy. We are doing attitude with grace. So here's to turning 40, graciously. "It is all about acceptance." I still have a few years to go until I hit that one - I'm 32. My husband, however, is pretty close to it - two and a half years to go. I always thought 30 would be huge and it really wasn't. Life still ticks forward doesn't it? I hope you have something nice planned to mark it though. I'm not sure I've achieved anything in the last 38 years and after being a stay at home mother for the last nine years I don't think there's much hope of life beginning at 40! I am only in my late twenties, but I do relate to that typically middle-aged rethinking of my life. Most of these questions don't apply to me yet, but I am happy to be able to answer "yes" to the ones that do. For now. I reached my big 40 this year and I have asked myself a lot of these questions! I turned 40 this year and have managed quite well but turning 30 did cause me a lot of stress. Ah a bit of a mix and I still have 4 years to go! Oh to be 40 again! Mind you I did rather well on the quiz so maybe I've survived the mid-life crisis and am merely heading towards batty old lady syndrome! I'm not quite there yet, but will be soon enough, I'm sure! But yes, I'm happy enough in my own skin and with life, so I see no crisis approaching! I turned 40 this year and if anything its given me a kick up the bum. Ive accepted the way I look and I am now determined to live my life for me as well as my family and any opportunities that come my way are now grabbed!!! I'm still a bit away from 40 but by the check list, I'm well into middle age! Thanks ;-). Great post. Provided some much needed giggles. I'm 33 and very aware 40 is looming ever closer!